I can tell you this has got to be one of the most humid Summers I can remember, and being such one of the hottest. But, Summer is finally winding down with cooler weather here soon, but not quite here yet as it is very warm and muggy this morning. But, nowhere near as bad as it has been. I have to send an apology out to Rod and Cory as this review is very late, but better late than never right? :blush: I received this Rocky Patel Fifteenth Anniversary Robusto to review, which I’ve been really looking forward to giving a try as I’ve always been a Rocky Patel fan. I know I’ve really enjoyed the sungrown, which several years ago had the pleasure of sharing with a friend who ended up puking from its strength. Ha! 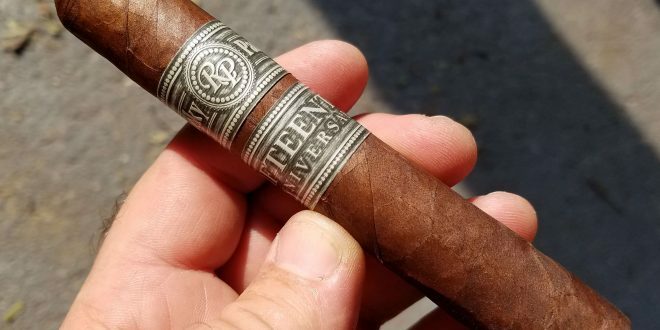 This is one nice looking stogie with a medium brown Ecuador Habano wrapper that has a bit of oiliness to it and what looks to be very fine tooth. It has a decent weight in the hand, not too light, not too heavy, and has very little give when squeezed. The bunching in the foot looks good as well as in the head after clipping, maybe a tad bit of over filling? But, when I take a few puffs on the unlit cigar, I find the draw is perfect with what I have to say tasted of well-aged tobacco. After toasting the foot and getting a good fire going, I take a few puffs to get the smoke flowing. I let it rest for a bit, couple more puffs, and then take my first draw. 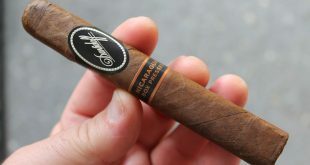 As I let the smoke escape slowly through both mouth and nose, I got tastes of wood, leather and a dark earthiness with a hint of cocoa in the somewhat long finish. I can say the flavors paired excellently with my coffee. As I head into the halfway mark, which hasn’t taken me long since I’ve had a hard time sitting the cigar down (it is REALLY good), the prominent flavors continue to be of strong wood, leather and earth with a rich cocoa bean lasting in the finish. The draw has been spot on with the burn going slightly to one side, but nothing major at all. The ash a medium to dark gray, which fell off on its own about a third in. There was very little coning when the ash did fall, which confirms even more (in my mind) that the tobacco has some decent age and has married well together. 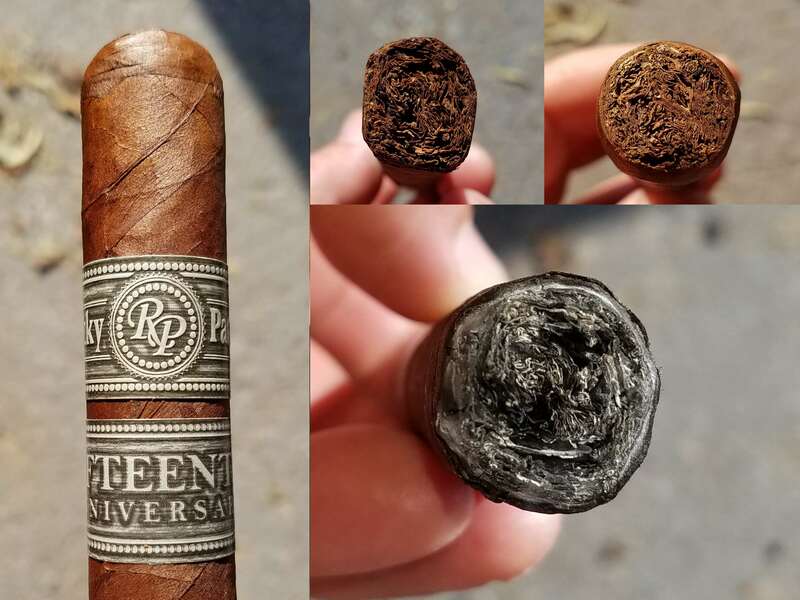 As I look at the ash, the wrapper is white, binder is black, and filler is white…interesting. The smoke itself is close to full strength and somewhat heavy on the palate, which is perfect for my taste. There’s some spiciness on the back of the tongue, but not overpowering at all. 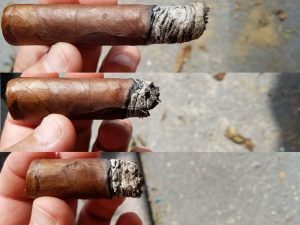 Definitely a full-bodied cigar. While it is a bit warm out, the nice breeze blowing through under the shade of the gazebo is making it feel quite nice out. It’s a somewhat overcast day, which I need to check the weather as I plan to take the pontoon out on the lake later this afternoon. Got to enjoy what warm weather is left ya know! While I love summertime, I have to say I’m kind of looking forward to cooler weather. After the halfway mark on this stogie, the smoke kicked up a notch to full strength, which again for me hit the spot. I have to say that I found the leather was coming through a bit more with the woodiness taking a back seat, but the cocoa bean taste is still there in the finish. 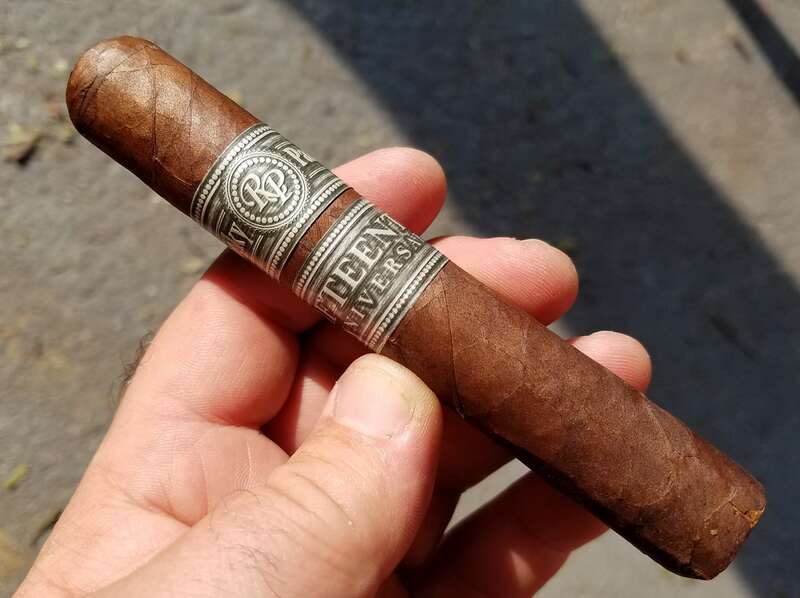 I have to say that this was one incredibly good cigar matching my palate perfectly with medium to full strength and body, rich flavors of wood, leather, earth and a very nice cocoa bean in the finish. It had a perfect draw from beginning to end with an even burn that produced tons of deliciously smooth smoke. 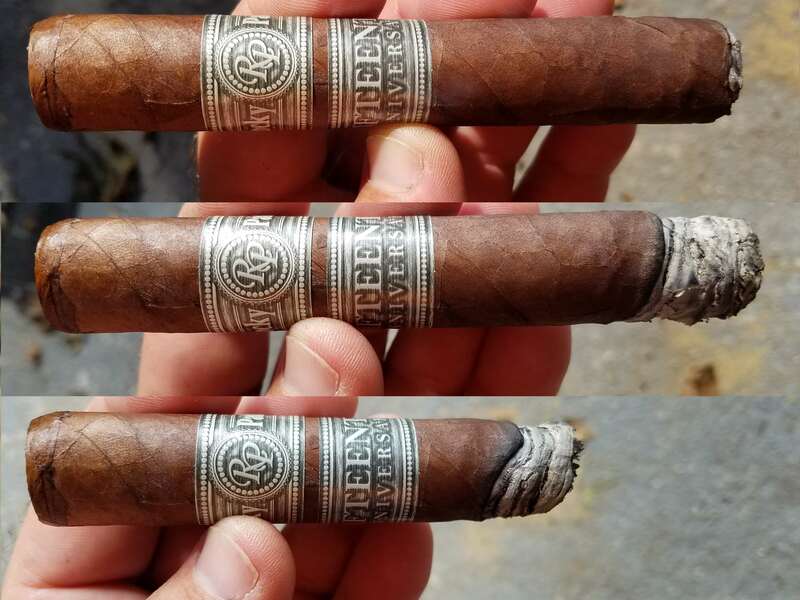 I highly recommend giving these a try if you haven’t already, would love to see some others share their thoughts on what I believe to be an outstanding smoke. Definitely get with Cory at Famous, grab up some of these up! Many thanks again to both Cory at Famous Smoke and Rod for the opportunity to try out the Rocky Patel Fifteenth Anniversary! Thoroughly enjoyed it my friend! Hope everyone is doing well!